Whenever I was incarcerated by successive military regimes from 1985-1998, the Amnesty International (AI) waged an effective campaign for my release. Through the activities of the AI and other progressive organizations, I was able to regain my personal liberty without any conditionality. Notwithstanding that I was charged with many criminal offenses including treasonable felony the AI declared me a prisoner of conscience. In thanking the AI for its contribution to the defense of human rights and demilitarization of the country, I am compelled to point out that while human rights defenders and workers are no longer detained without trial, the most economically and socially disadvantaged are still subjected to illegal arrests, detention and other human rights violations and abuses. With the establishment of an office in Abuja, it is undoubtedly clear that AI has decided to be more effective in the defense and promotion of human rights in Nigeria. Through the campaign against the death penalty AI has saved the precious lives of many people. Through the campaign against illegal detention, AI has secured the liberty of many prisoners of conscience and other detainees including those who were held in dehumanizing conditions. Through the campaign for fair trial, AI has ensured that the right of many accused persons to fair hearing is respected. Through the campaign for freedom of speech and assembly, AI has expanded the democratic space for many people who were otherwise excluded from political participation. Through the campaign for the observance of freedom of thought and conscience, AI has protected many victims of religious and political persecution. But AI has to do much more to promote universal respect for economic and social rights if the organization is to contribute to the attainment of the principles of universality, indivisibility and interdependence of all human rights—civil, political, economic, social and cultural rights. No doubt, this approach requires the active collaboration of AI with the victims of corruption and exploitation and underdevelopment. In this address, I shall speak on the lacuna in human rights discourse given the deliberate plan of the ruling class in the country to use the law and human rights to frustrate the prosecution of the looters of our commonwealth. In response to the role of lawyers who secure injunctions to prevent the arrest, investigation and prosecution of rich criminal suspects accused of corruption we shall link the recovery of our looted wealth to the duty of the government to provide for the welfare and security of all citizens. Our position will be anchored on the provisions of local and international human rights instruments. Chapter 4 of the Nigerian Constitution has made elaborate provisions for civil and political aspects of human rights. However, the fundamental objectives and directive principles of State Policy which provides for social, economic and cultural rights in chapter 2 of the Constitution are not justiciable. But similar rights are incorporated in the African Charter on Human and Peoples’ Rights (Ratification and Enforcement) Act (Cap A9) Laws of the Federation of Nigeria, 2004 are enforceable. Anyone whose fundamental rights has been violated in any state of the federation is entitled to seek redress in the appropriate High Court according to Section 46 (1) of the Constitution and the Fundamental Rights Enforcement Procedure Rules, 2009. But in actuality, human rights are enjoyed by a tiny minority of rich and powerful individuals who have the economic wherewithal to seek legal redress whenever such rights are violated. I had argued elsewhere that “human rights are not and should not be the preserve of the rich and wealthy. It ought to be realized that without adequate food the rights to life and human dignity are meaningless to the marginalized and vulnerable segment of the population. Similarly, the right to housing has no relevance to people who are displaced and expelled from cities due to urban renewal projects carried out by governments. When the right to life of certain persons is violated through extra-judicial killing by the police and other law enforcement agencies those who depend on them for their education and welfare are rendered vulnerable. Without access to education, the right to freedom of expression is of no consequence to millions of illiterate people. 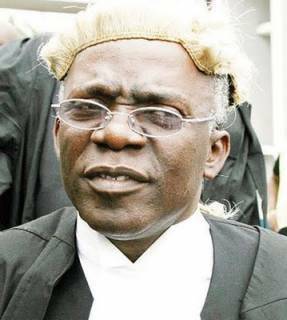 In view of pervasive and almost absolute poverty in the society, it is no longer in dispute that socio-economic rights are not made justiciable, a majority of citizens cannot fully and effectively enjoy the civil and political rights guaranteed by the Constitution and international treaties.” (Falana: Nigerian Law on socio-economic rights, 2015). Kolawole Olaniyan in his celebrated book Corruption and Human Rights Law in Africa (Oxford: Hart, 2014) has developed a framework for complementarity between promoting and protecting human rights and combating corruption. He makes three major points regarding the relationship between corruption and human rights law. First, corruption per se is a human rights violation, insofar as it interferes with the right of the people to dispose of their natural wealth and resources and thereby increases poverty and frustrates socio-economic development. Second, corruption leads to a multitude of human rights violations. Third, he argues that human rights mechanisms have the capacity to provide more effective remedies to victims of corruption than can other criminal and civil legal mechanisms. He emphasized three major aspects of human rights in practice – the importance of governing structures in the implementation and enjoyment of human rights, the relationship between corruption, poverty and underdevelopment, and the threat that systemic poverty poses to the entire human rights edifice. President Muhammadu Buhari talks of $150 billion stolen in the last 10 years. The criminals who stole the huge funds and western countries which are keeping the funds have violated the human rights of the Nigerian people to development. If a large chunk of the stolen funds is retrieved and earmarked for socio-economic development, the government can create jobs, guarantee security and ensure infrastructural development. As President Buhari puts it, “The fight against corruption is, in reality, a struggle for the restoration of law and order. Corruption and impunity become widespread when disrespect for the law is allowed to thrive in society. Disrespect for law also thrives when people get away with all sorts of shady deals and the court system is somehow unable to check them. Ability to manipulate and frustrate the legal system is the crowning glory of the corrupt and, as may be expected, this has left many legal practitioners and law courts tainted in an ugly way. Resource-starved African nations are subsidizing developed countries’ industries and social services [through the] exodus of human capital [and] the illicit export of financial capital from African countries – or capital flight. This is not a new phenomenon, and it shows no signs of abating. Over the past four decades, sub-Saharan Africa has lost a staggering $700 billion due to capital flight. In addition to trade mis-invoicing, smuggling, and embezzlement of revenues from natural resource exports, a substantial part of the capital flight was financed by external borrowing. We estimate that every year 40 to 60 cents of each borrowed dollar spins out of the revolving door as capital flight, often returning to the same banks that issued the loans. On a net basis, Africa is transferring more money to the rest of the world than it is receiving in terms of borrowing and aid . . . Capital flight, and the burden of servicing the debts that financed it are partly to blame for the conditions that create the other economic problems faced by the continent … Illicit financial flows drain scarce public resources that could have been used to finance public services including education and health. It partly explains why there are not enough schools, clinics, and medical equipment; it also explains the poor working conditions for doctors, teachers, and other professionals that force them to seek greener pastures abroad . . . Obviously African countries have the primary responsibility to devise and implement strategies to keep capital onshore. But the international community also has an equally important responsibility to root out the perverse incentives and opacity in the financial system that enable and perpetuate the financial haemorrhage faced by the continent. (Léonce Ndikumana and James K Boyce, Africa’s Odious Debts: How Foreign Loans and Capital Flight Bled a Continent (London: Zed Books, 2011). Corruption, especially large-scale, is both a cause and consequence of poverty. The basis for this proposition may not be too far-fetched. On the one hand, corruption enriches a select few, while invariably subjecting many to poverty, especially the economically and socially vulnerable groups of society. Clearly, the enrichment of the few at the expense of the many, especially in a continent of limited resources, can hardly help the cause of those who live in poverty. And, as noted, the theft and stashing abroad of public funds, where such funds are then invested to improve the economies of developed countries, is unfair as it undermines developing countries’ foreign investment, long-term growth, development and prosperity. Thus, from a societal standpoint, corruption ultimately breeds poverty, weakens or destroys critical institutions of governance, erodes the operation of democracy, the rule of law and moral fabric of society, obstructs justice, and retards social and economic development. From a government standpoint, it promotes impunity and arbitrariness and encourages both money laundering and illicit money transfers (‘dirty money’). On this account, corruption violates human and people’s rights – civil, political, economic, social, and cultural – disproportionately affecting the economically and socially vulnerable. Accordingly, the idea of corruption as a human right issue is intrinsically linked with the relationship between poverty, under-development and lack of respect for human rights. (See Corruption and Human Rights Law in Africa, Oxford: Hart, 2014, p 122-124). Section 35 of the Constitution of Nigeria 1999 and Article 6 of the African Charter on Human and Peoples’ Rights guarantee the right to personal liberty of every person living in Nigeria. In a plethora of cases, the courts have upheld the fundamental right of citizens and foreigners alike to freedom from unlawful arrest and detention. To ensure that the right to personal liberty is respected it can only be encroached upon by the State in a manner permitted by law. In other words, a person may be lawfully arrested or detained if there is reasonable suspicion that he/she has committed a criminal offence. Any person whose right to personal liberty has been breached without recourse to law is entitled to apply to a high court to secure release from custody and payment of compensation accompanied by a public apology. Where criminal suspects in custody are not promptly charged to court, the detaining authority is required to apply for a court order to legitimise the detention. This is to ensure that no one is held in custody without any legal basis or due process of law. Last week, some of the principal suspects implicated in the probe of the $2.1 billion and N643 billion arms gate were nabbed by the Economic and Financial Commission. Notwithstanding the confessional statements credited to the suspects and some of their family members a number of shady characters have accused the Buhari Administration of persecution of political opponents. While some public commentators have called on the government to respect the human rights of the suspects they seem to have conveniently forgotten that the fund allegedly stolen was meant to equip thousands of soldiers whose right to life has been violated as they were killed by terrorists. Pursuant to the ex parte orders validly issued a magistrate court the suspects have since been detained for the purpose of investigation. But in a desperate move designed to divert the attention of the Nigerian people and the international community from the grave allegations of reckless and criminal diversion of the public funds earmarked for arms procurement to prosecute the war on terror. A Senior Advocate of Nigeria was alleged to have that “a magistrate court has no power to issue a holding charge warrant”. Since these views are at variance with the current human rights legal regime in Nigeria, it is germane to point out that while holding charge remains illegal and unconstitutional a remand order issued by a magistrate for the detention of criminal suspects for the purpose of an investigation is not illegal. The attention of the “critics” ought to be drawn to sections 293-299 of the Administration of Criminal Justice Act, 2015 (ACJA) which stipulate that a suspect arrested for an offense which a magistrate has no jurisdiction to try, shall within a reasonable time, be brought before a magistrate court for remand. The order which shall be for a period not exceeding 14 days may be further extended provided that if the investigation is not concluded within 28 days, the court may summon the appropriate authority to show cause why the suspect should not be unconditionally released. Suspects who are remanded in custody are at liberty to ask for bail or apply to the appropriate high court to secure the enforcement of their fundamental right to personal liberty suspects. However, in recent time, many persons invited by the police or anti-graft agencies to respond to allegations of corruption, fraud, money laundering, unjust enrichment, etc. have obtained court orders restraining the State from investigating or prosecuting them. Some have even obtained orders of an injunction which are to last in perpetuity. As I have argued elsewhere, no court has the power to confer any perpetual immunity on any citizen. In Inspector-General of Police v Fawehinmi, the Supreme Court held that a Governor, who is protected by the immunity clause under section 308 of the Constitution are not investigated. Once the public officer completes his/her term of office the immunity so conferred by the Constitution ends and cannot be extended even for a day. As the court has no power to turn any citizen into an outlaw, it cannot prevent the police or anti-graft agencies from arresting or prosecuting any politically exposed person once there is reasonable presumption that he/she has committed a criminal offense. While due process should be observed in the fight against corruption and the impunity of perpetrators, human rights should never be used to undermine justice in the sense of being used to defeat investigations and prosecutions of corruption by high-level governmental officials. No doubt, the investigation and prosecution of corruption crimes is impugned where human rights are violated, corrupt officials should not be allowed to use technicalities as pretenses for human rights to defeat corruption charges and prosecution. Using human rights as trump cards to circumvent and avoid punishment and accountability for large-scale corruption is itself a violation of the human right of the Nigerian people to development. Human rights law, like any branch of law, should not be used to facilitate or perpetuate the kind of impunity with which successive governments and senior public officials have engaged in corruption, especially because it is the most economically and socially disadvantaged among us that stand to suffer most in cases of large-scale corruption. In his comment on the earth-shaking revelations oozing out of the EFCC with respect to the armsgate the Edo State Governor, Comrade Adams Oshiomole has asked if the money for the procurement of military hardware was appropriated. Indeed, part of it was appropriated. For instance, former President Jonathan had sought approval to obtain a $1 billion loan to purchase adequate weapons for prosecuting the war on terror in September 2014. The approval was promptly granted by the National Assembly. Based on my involvement in the defense of scores of officers and soldiers charged before the courts-martial for demanding for equipment to fight the dreaded Boko Haram troops I confirmed that the loan was obtained but diverted. All efforts to convince the members of the military courts that the huge funds earmarked for arms procurement had been stolen fell on deaf ears. In the circumstance, I wrote to the then Finance Minister and Coordinating Minister of the Economy, Dr. Ngozi Okonjo-Iweala to demand an inventory of the arms bought with the $1 billion loan. In her embarrassing reaction to my request, the minister stated that she was not in a position to account for the loan! When I persisted in demanding for transparency and accountability the immediate past chief of defense staff, Air Marshal Alex Barde claimed that the armed forces led by him lacked the equipment to fight the insurgents. The irresponsible statement was belatedly made while the officer was retiring from the military. In his reaction to the statement the then National Security Adviser, Col. Sambo Dasuki claimed that the equipment ordered by the Jonathan administration had not arrived the country. To divert attention from the satanic conduct of the public officers involved in the shady sharing of blood money two of the courts-martial convicted and sentenced 70 soldiers to death. 12 of the soldiers were convicted for mutiny for protesting the brutal killing of 10 of their ill-equipped colleagues by a band of terrorists. The remaining 58 refused to advance to the battlefront until they were supplied with adequate arms. But for having the temerity to demand equipment to fight the well armed and well-motivated terrorists the young men were condemned to death. In the case of Nigerian Army v Brig-General Enitan Ransome-Kuti it was disclosed that the defendant had repeatedly requested the Chief of Defence Staff, Air Marshal Alex Barde to provide military equipment and demanded that the military camp in Baga be fenced to prevent the Boko Haram sect from invading the town. The CDS turned down the requests on the ground that there was no money! A few weeks latter, Baga was overrun by the insurgents. The Special Court Martial discountenanced the evidence of the criminal negligence of the then military authorities and proceeded to sacrifice Gen Ransome-Kuti. Since it has now been established that the huge fund set aside for prosecuting the war on terror was cornered and shared, there can be no justification whatsoever for not setting free all the convicted officers and soldiers. Since scores of others were killed by the terrorists due to lack of equipment and other vital supplies, the people involved in diverting the money appropriated for arms procurement must bear full responsibility for such avoidable deaths. Thus, by diverting the huge fund for arms procurement, the suspects deliberately caused the death of not less than 25,000 ill-equipped soldiers and unarmed civilians including children. For committing such grave crimes against humanity, the suspects should be referred to the Prosecutor of the International Criminal Court in The Hague for prosecution. “…about $1billion recovered by the Abdulsalami Abubakar junta was promulgated into a decree. The legislation was enacted to prevent anyone from laying any claim to the stolen funds. Based on the request that I made under the Freedom of Information Act sometime in 2013 the immediate past Secretary to the federal government, Senator Anyim Pius Anyim confirmed that all the funds and properties listed in the Forfeiture of Assets Decree had been forfeited to the federal government. In the second volume of his book entitled “My Watch,” President Obasanjo has revealed that he recovered $2 billion, £100 million and N10 billion from the Abacha loot. According to a former Attorney-General of the Federation, Mr. Mohammed Adoke SAN, the Jonathan Administration recovered $970 million. Another sum of $458 million seized by the Obama administration last year has not been repatriated to the country. The Buhari administration should take steps to have the $458 million recovered. Sadly, a large chunk of the recovered loot is alleged to have been re-looted by some criminal elements. The Buhari regime should ask the office of the Accountant-General of the Federation to account for the $4billion recovered from the Abacha loot. Also, the banks which illegally kept the funds for 10-15 years should be asked to pay interests and damages for criminal negligence in warehousing stolen funds from the late military dictator who was known to be a public officer at the material time. ” (The Interview Magazine, Issue 4, December 2015). On account of its avowed commitment to eradicate corruption and impunity in the country, the Buhari regime should not limit the recovery of our looted wealth to the Jonathan era. All public officers who have taken part in the criminal diversion and stealing of public funds should be brought to book without any delay. The Transparency International has ranked South Africa, Nigeria and Kenya as the leading corrupt countries in Africa. While the classification is not disputed the hypocrisy of the organization should be exposed. It is the height of fraud not to identify the western countries which receive and keep stolen fund from Africa as the most corrupt countries in the world. The Transparency International has never exposed the role of the banks in some islands which are allowed by the international financial system to warehouse billions of dollars stolen from African countries by criminally-minded leaders. The AI should not behave like Transparency International, which has perfected the act of blaming the victims of large-scale corruption promoted by western countries, the World Bank and the International Monetary Fund. To promote human rights in Nigeria at this point in time AI should pressurize western government and financial institutions to repatriate the looted wealth of the country for the actualization of the socio-economic rights of the Nigerian people. Conclusion: A few years ago, one of the heads of the anti-graft agencies advocated the suspension of the fundamental rights of public officers charged with serious cases of corruption. I was vehemently opposed to the suggestion at the time. But I have since reviewed my position. Having regards to the deleterious effect of grand corruption on the society the courts should desist from granting bail to suspects involved in serious economic and financial crimes since terrorism and armed robbery are not usually admitted to bail by our courts. Therefore, the fight against high-level official corruption should be seen as part of the efforts to address and improve the conditions of the most economically and socially disadvantaged, including through the effective recovery of stolen funds, and judicious and transparent use of such funds for developmental programs that would contribute to effective enjoyment of all human rights by Nigerians. In short, my point is that corrupt officials should not be allowed to use the judiciary to stop or perpetually delay corruption cases against them.